In this configuration a transistor is placed in the feedback path of an opamp wired in inverting mode. Collector of the transistor is connected to the inverting input of the opamp, emitter to output and base is grounded. The necessary condition for a log amp to work is that the input voltage must be always positive. Circuit diagram of an Opamp-transistor log amplifier is shown below. Where Ic is the collector current of the transistor, Iso the saturation current, Vbe the base emitter voltage and Vt the thermal voltage. Since input pin of an ideal opamp has infinite input impedance, the only path for the input current Ir is through the transistorÂ and that means Ir = Ic. Purpose of hysteresis in a comparator? 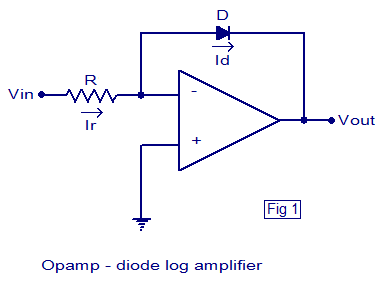 How current characteristics of pn junction employed in a log amplifier? In your article, saying that for Opamp-transistor log amplifier, “The necessary condition for a log amp to work is that the input voltage must be always positive.” Is there any mistake? I feel the input voltage should be always negative, not positive. Please help me clarify this. Thank you. What would happen if the input voltage is negative? On both cases. Why use it for mearsurement light? Can you please tell me the limitations of basic log amplifier? Aren’t these circuits very temperature dependent?. Do you have an idea of how strong this dependence will be? does equation five change if opamp is ideal. 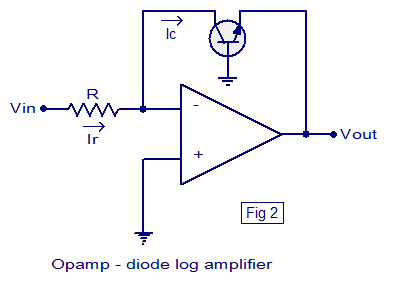 which diode is use in log amplefier? PN junction diode is used. Excuse me but how can a NPN transistor work when base is grounded? Please make me clear about the final equation in diode model..Thank you..